A few years ago, we were in Israel for my older son Sam’s Bar Mitzvah. It was a very special time shared with family and friends. We rode camels to a Bedouin-style camp in the Judean desert, and enjoyed a night sitting around a campfire under the stars with Sam’s teaching, delicious food, local wine and a great feeling of joy. I could not have been more proud! The evening before the Bar Mitzvah, our friends Nitzan and Yael invited us for a pita and labne party at their home on their moshav. 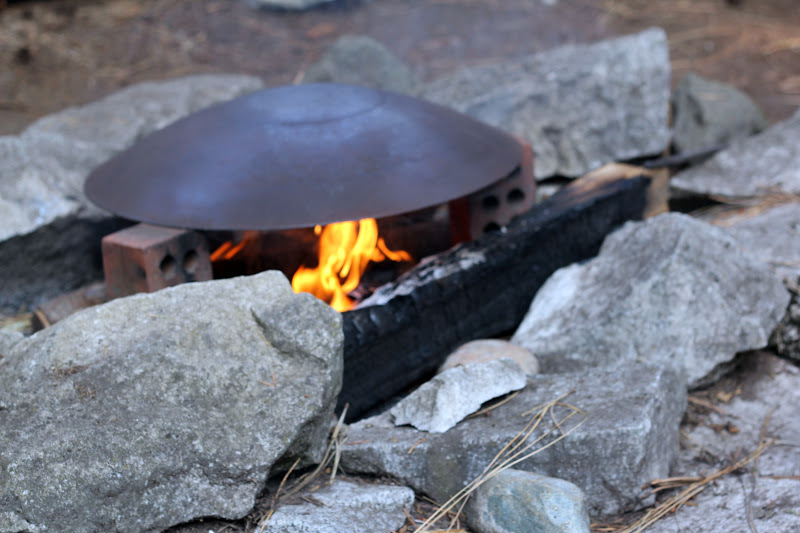 At the party, the pitas were cooked on a saj (similar to an inverted wok) over an open fire. These pitas were the most delicious we'd ever had! 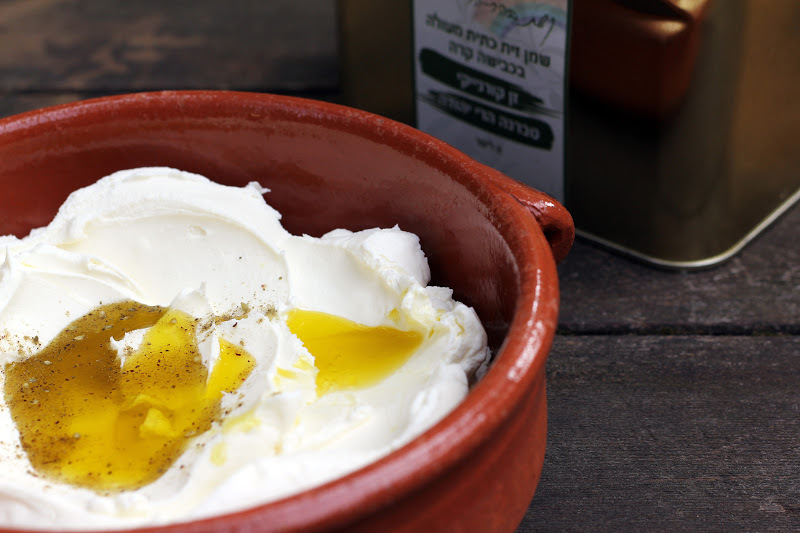 Labne (a soft yogurt cheese) was served to smear onto the pita along with za'atar (a spice blend found in Middle Eastern markets of sumac, thyme, sesame seeds, oregano and salt) and olive oil. 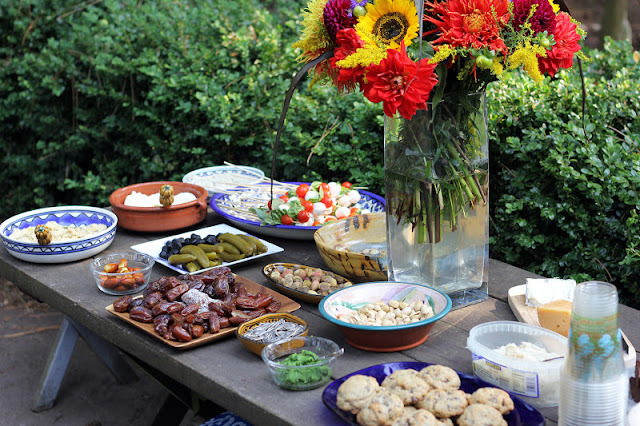 The buffet table, set under a flowering tree, was full of fresh salads, fruit and drinks. A feast! After dinner, we lounged on the grass and sipped homemade mead and limoncello (made by Nitzan from their honey and lemons) and enjoyed Yael’s lovely cheesecake with ice cream and mulberries. Well, after that evening, we had to have a saj of our own and brought one home with us. 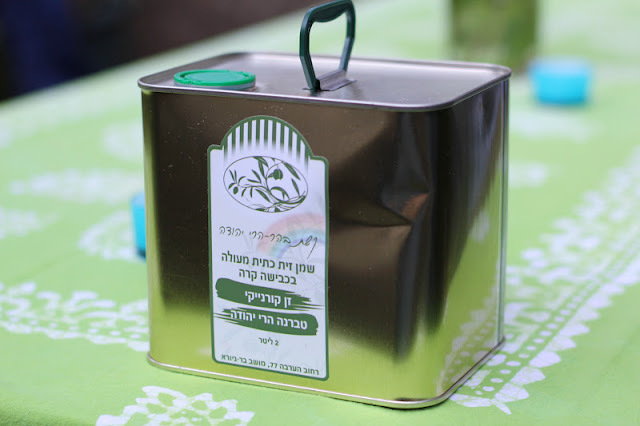 This past August, Nitzan and his family visited us in Seattle and brought homemade olive oil that they pressed from the olives they grow on their moshav. This is unbelievably good olive oil and such a special gift! We have warm memories of Nitzan and Yael’s pita and labne party which have inspired us to cook over our saj many times in the backyard. When Maren was visiting us last month, we brought out the saj, lit a fire, filled the picnic table with food and spent the afternoon chatting and burning our fingertips on hot pita. Heavenly. Spoon the yogurt into a fine meshed yogurt strainer (or into some cheesecloth and tie up) and set over a bowl in the refrigerator to drain for 24 hours. The next day, remove the yogurt from the strainer or cheesecloth and stir the salt and olive oil into it. Taste for salt and add additional if desired. Serve in a small bowl with additional olive oil drizzled on top and a sprinkle of za’atar. In a large bowl, dissolve the yeast with the sugar in the warm water. Let sit until foamy, about 10 minutes. Add the salt, 1 tablespoon olive oil, all-purpose flour and 1 1/2 cups whole wheat flour. Stir with a wooden spoon until it comes together. Now switch to kneading with your hands. Add the remaining flour until a nice dough forms (you may not need all of it). Knead on a floured board until smooth. Put dough back into the bowl and cover with a dish towel. Let rise for about 1 1/2 hours. Punch the dough down and divide into 8 pieces. Roll each piece into a 6-inch circle. Let sit for about 20 minutes. Preheat oven to 425 degrees. Place a piece of parchment on a baking sheet and a put pan in oven to get hot. Transfer 4 of the pitas to the prepared baking sheet and bake for 6 minutes. Repeat with remaining pitas. 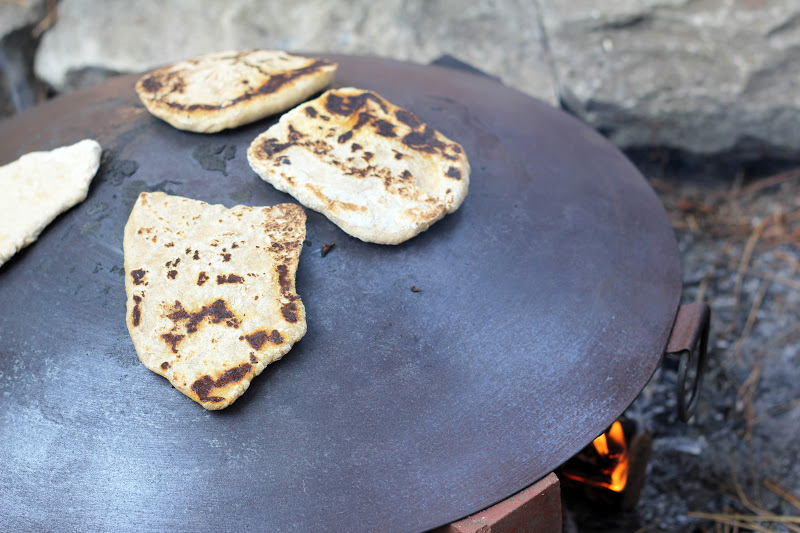 Or, if you have a saj or large wok, suspend it on bricks over an open fire and grill the pita dough until puffed and blistered. Serve the pitas with a bowl of labne drizzled with olive oil. Add a dollop of zhoug for some spice! Mmm,labne and homemade pita,so yummy! So yummy is right, Yaelian! I just love the combination of pita and labne with good olive oil. That dinner in Israel sounds amazing! How wonderful that you get to recreate it at home at your leisure! I would love to try homemade pita. It was a fabulous dinner - very special memories! And yes, it's marvelous that we could (literally) bring it home with us. Hope you can try homemade pita sometime. Warm pita from the oven (or off the saj) is divine! What an amazing bar mitzvah story. That sounds much more appealing to me than a black tie affair on a Saturday night. Homemade olive oil? My goodness, how fantastic! Fantastic is a good word for the oil, Molly! So green and olive-y. Sam's bar mitzvah was incredible. It reflected him so well, and still does. Sigh... a very special time. Oh wow, two of my favorite things homemade pita and labne. What a wonderful celebration, everything sounds amazing. Will definitely be trying both recipes, now to hack a saj, or buy one if I can find. Ok, that's it, this must be the third post about labne I've seen recently - the food gods are telling me something! I have to make this. LOVE this story and can't wait to share a meal with you sometime soon. Listen to those food gods, Beth! I hope you enjoy the labne. Wish we could share a bowl and chat. It really was a special time, and definitely reflected Sam - he made a terrific choice! And did we eat well during our visit...Ottolenghi and Tamimi's new book, Jerusalem, is evoking lots of delicious memories now. I hope you enjoy the pita, Brooke! I'm savoring every drop of the olive oil and hoping it lasts for a long time. When it runs out we'll just have to go visit and get some more! I love your blog Hannah for so many reasons (wonderful writing, beautiful pictures, keeping up with what you're doing), but most of all because it exposes me to things I've never cooked! Love learning about new traditions, both in and out of the kitchen. Aww, thank you, Erina! I appreciate your sweet words and I'm delighted to share. Loved seeing you last night - I'm so excited for your camera debut! I would send you a picture of my (your)gorgeous pitas, but my iphone is fried. I was already making a chicken gyro recipe when I saw your post. So much more delicious with homemade pita and a quick little yogurt sauce. Thank you, Alyssa! It was truly unique and memorable. Let me know if you'd like info on the spot where we celebrated - I highly recommend it! Wonderful memories :) Homemade pita...delicious & I must make some of that cheese. I hope you enjoy the labne, Mairi! Since you have summer nearing it would make a lovely backyard appetizer.